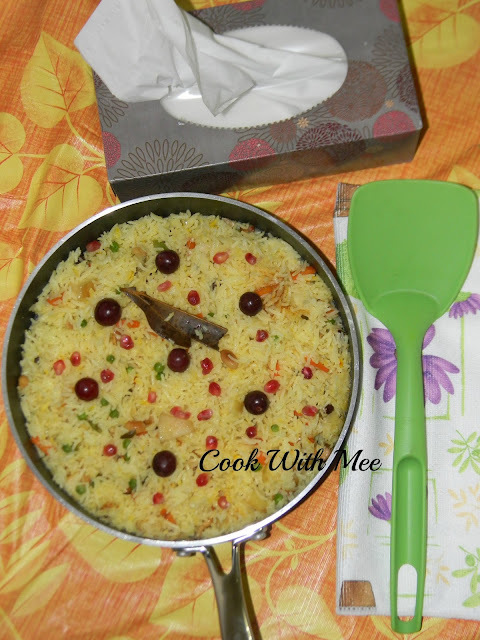 It’s been a long time I didn't post any RICE recipe in my blog. Friends are asking me about that, they want some different RICE preparation. Even I am also thinking the same. My dearest friend Laxmipriya shared one lovely recipe with me which is a very famous and healthy one, because so many fruits are there in the dish. Any guesses friends, many of you might have tried this one before but I never tried this before the KASHMIRI POLAO. Because of fruits like apple, pineapple, grape, pomegranates it is very healthy. I think this one is really very good for kids also, because most of the kids don’t like to have fruits but with a preparation like that they will definitely enjoy it. With a simple curry or just a bowl of raita also this polao is perfect for your dinner or lunch. 2. Few Saffron stands soaked in half cup of warm milk. 5.One table spoon of ghee. 1.Clove:2,Cardamom :2,One small cinnamon stick,One small bay leave,a small piece of jaifal. 2.Few cashew nuts, few almonds. Few Pistachios, Few Raisins. 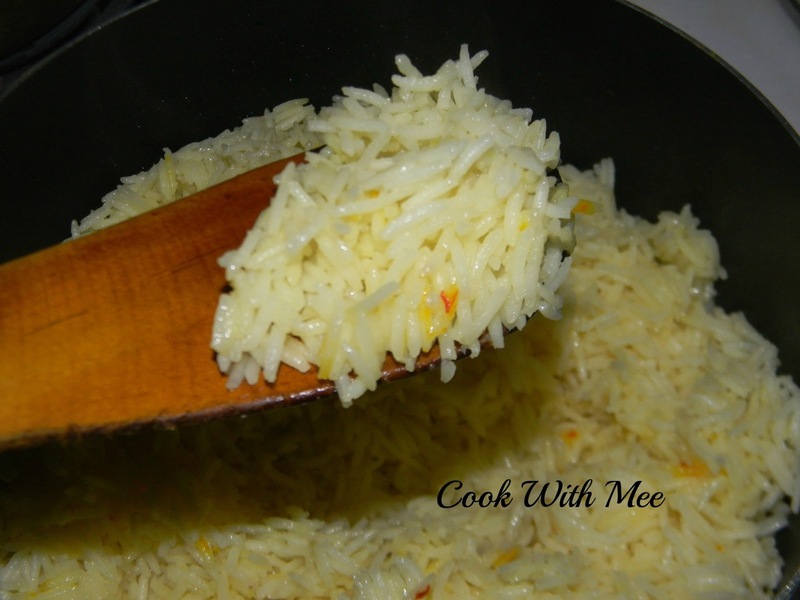 3.Half cup of finely chopped carrots and French beans. 4.Frozen peas a hands full. 5.A pinch of garlic powder,a pinch of fennel powder, a pinch of cardamom powder, a pinch of nutmeg powder. 6.A small bowl of chopped apple & pineapple. 7.one tea spoon of rose water (optional). 9.Two table spoon of ghee. Add one table spoon of ghee in a vessel and add the washed rice and fry for some time. Now add the water and saffron soaked milk with some salt and sugar. Cook the rice till it 80% done. Keep it aside. Now add some ghee in a pan and fry cashew almonds and pistachios till they little brown then add the raisins and after that take all out from the pan. Now add some more ghee and add all the whole garama masala after few seconds add the chopped carrots, beans and peas and fry for some time. Now add the fried dry fruits and the chopped fruits stir for some time, finally add the cooked rice and mix well with everything. Finally add the garlic powder, fennel powder,cardamom powder, nutmeg powder, rose water and the cream. 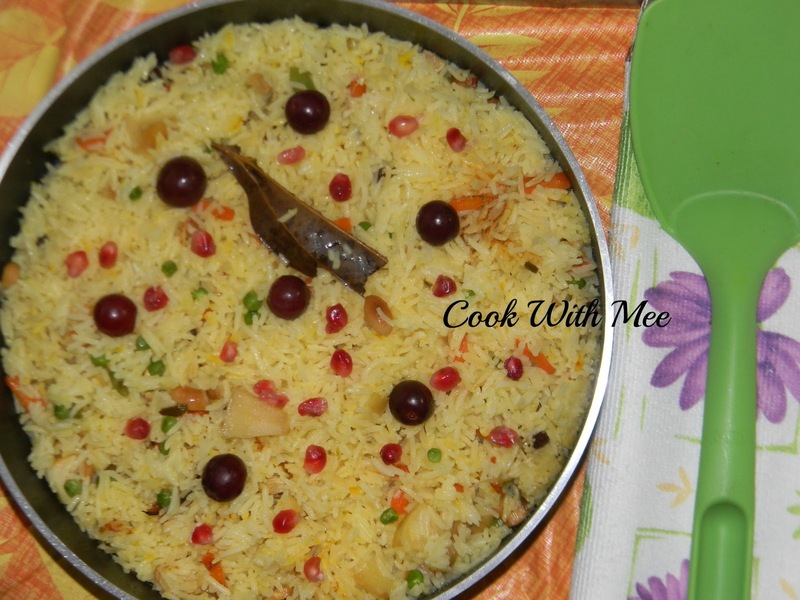 Mix well with everything and cook with a lid till the rice completely cooked. 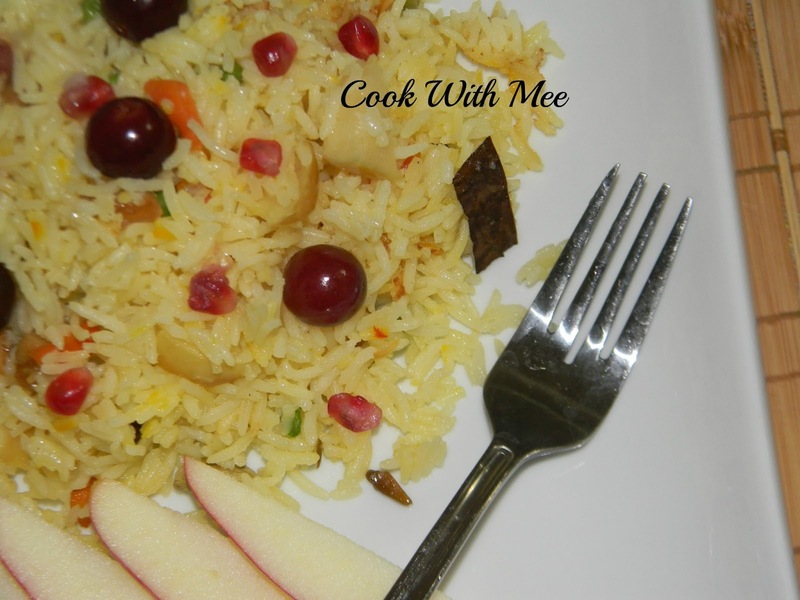 Garnish with grapes and pomegranate your KASHMIRI POLAO is ready, Serve hot with any curry.